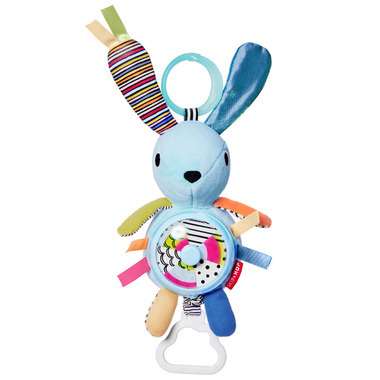 Skip Hop Vibrant Village Pull and Spin Activity Bunny features a pull cloud teether for spinning colours and patterns. Wow and delight baby with the playful spinning toy! The bunny baby toy offers exciting visual and tactile stimulation anywhere. My baby loves the spinning propeller. Great cause and effect toy. The Bunny is super soft too, and there's plenty of crinkling features to satisfy baby's craving. Thanks Skip Hop!